I'm in gaming limbo right now. I still haven't finished FFXIII, haven't started Bioshock 2, am still loving the Blur beta, and haven't played enough StarCraft2 Beta to write about it yet. So, what am I going to write about tonight? Fieldrunners. When I'm in gaming limbo - or just don't have much time to play games - I like to play quick games on my ipod touch. I do a lot of 60 second games, but I have a few others that take more time that I really like. One of them is Fieldrunners. 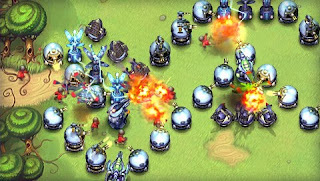 Fieldrunners is a simple tower defense game that is executed very well. The creeps try to get from the entrance of the level to the exit of the level while the player places and upgrades towers to kill them. If they exit the level you lose a life and when all lives are gone you lose the game. Pretty standard fare. I'm a sucker for tower defense games, but the thing about Fieldrunners is that it's formatted well for the ipod touch. When I pick up a tower it floats directly above my finger until I place it. Pull and pinch zoom in and out respectively. There are only 4 towers and each only has 3 levels of advancement. This might detract from another tower defense game, but on a handheld system that is used for pick-up-and-play the simple design helps players from becoming overwhelmed. Each tower has a specific task, without much overlap between tower types. I really enjoy the graphics of the game too, although the sound effects aren't all that interesting. Fieldrunners is, by far, my favorite tower defense game for the ipod touch. If you have a touch or an iphone the $3 investment is well worth the money. It has provided me with hours upon hours of entertainment. I'm glad you enjoy our game! Here's a tip: it's always more cost effective to upgrade an existing tower than to purchase a new one. Try to use cheap towers to extend your maze but upgrade the more expensive ones first before purchasing another one of the same kind. For example, upgrading a missile tower from level 1 to level 2 is cheaper than buying a second missile tower (it is discounted by 25%), but the upgrade makes it deal twice as much damage. Use the money that you save on additional defenses! There are exceptions to this rule, of course, but it is a good rule of thumb to follow! It's a great game, I hope I got some more people to check it out. It is one of my favorite ipod touch games.